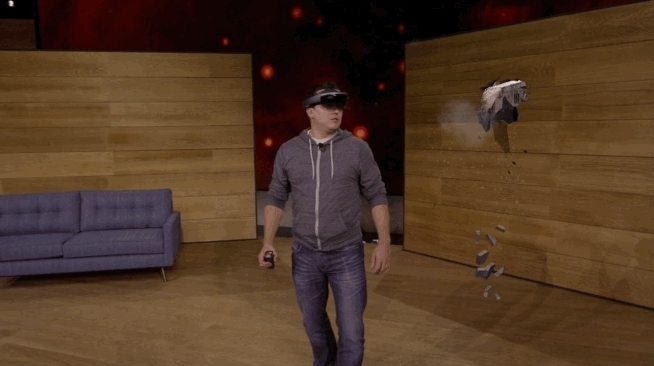 During today’s Microsoft Windows 10 event we got a brand new look at the Microsoft Hololens, the company’s mixed reality headset. The big news of the day was the announcement of a price and release timeframe for the first developer kits of the device, along with news that applications for them would begin today. But during the presentation we may have also gotten a look at an as of yet unannounced input device for the kit. Seen in this gif, the device appears to be some sort of cylindrical input about two inches in diameter that is held in the hand. There appears to be a small red button or light on the top. During the majority of the presentation the device was hidden by a holographic mesh that seemed to be locked to the demonstrator’s arm, however it very well could have been tied to the device itself – a somewhat less impressive achievement if that is the case. A look at the possible input device. It appears that the device uses either some sort of internal motion sensing technology to help reduce occlusion issues that might occur if the device is out of the Hololens’ field of view, but that is purely speculative at this point. Input is a huge component of the puzzle for immersion so if will be interesting to see what, if any, advancements Microsoft has made on this front. Microsoft has yet to comment on the device, but we have reached out for comment and will update this post if we hear anything new.